Yes, that good ole chemical capsaicin can have some rather odd effects upon critters of the mammalian persuasion who consume them. And of course you know that avian types don't have a problem with capsaicin so if you think you are a birdbrain then you should be able to eat all the chillis you want without feeling the heat! And I'm sure you all are aware that chilli plants are self-pollinators. Can you imagine if people were self-pollinators? Just think, all those hours a teenage guy spends in the bathroom could have more consequences than a musky odor and a red face! Not that I'm speaking from experience, mind you. It's, uh, just something I heard. Quick dave, change the topic! Oh, right. Hallucinations from consuming too much capsaicin laced homebrew. 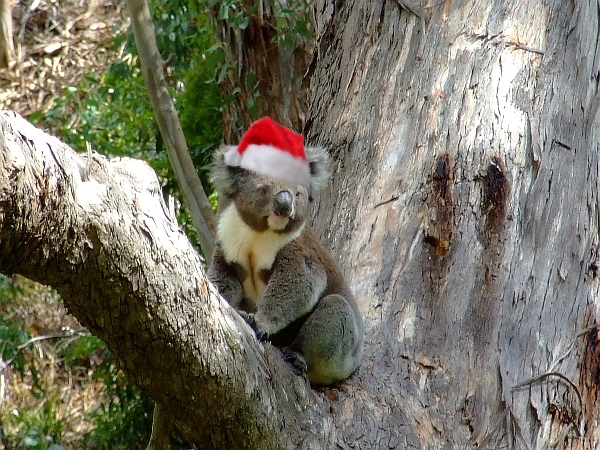 One can see koalas wearing funny things whilst out bushwhacking --I mean bush walking. Hmmmm, Santa sure don't look jolly in all the fur with a hat on in a 'stralian summer. Too much capsaicin laced homebrew can also cause the imbibber to strike even stupider poses than usual. 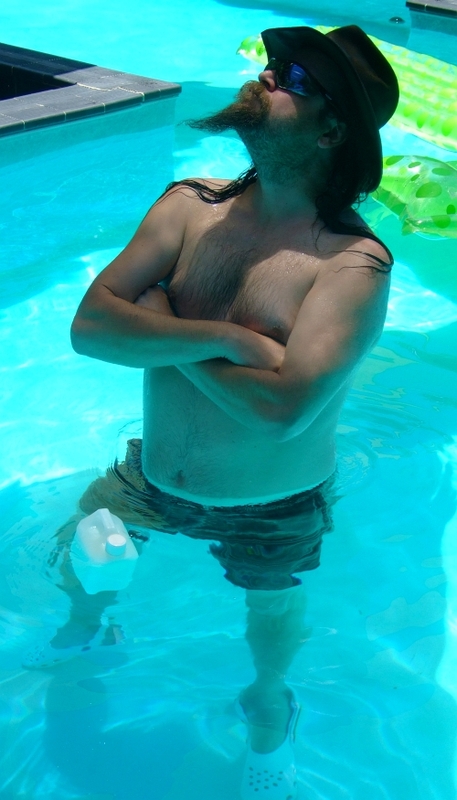 Bonus points will be awarded if you can figure out what's in the bottle floating near dave's crotch. And extra bonus points awarded if you can guess how much his cool, spiffy, new, white crocs cost. what is this, the quest to have people look at your crotch? huh? DUDE! and your crocs were $45 US dollars. ish. the news here says, australia thinks santa is a bad influence. its funny what the news reports! la isla d'lisa: But I thought everyone would like to look at it. You're off by a factor of 18 on the footwear, btw. 雨: Ah, latest secret communique from my Chinese masters. Fizzgig: Hadn't heard the first part of the news, but we have unfortunately been subjected to loads of the second news item. That is why I don't watch the news. Three Cheers for The Grinch!! Santa Parties Hard in Oz! Can Christmas be Saved?